There’s never a lack of things to do across the beautiful city of Boston. But, with the beginning of Fall greeting us, you might want to think of alternatives to your outdoor excursions. With crisp afternoons making way into chilly evenings, it’s quickly becoming cozy flannel season, my friends. But worry not, for fun still lurks just beyond the wintery nip! Luckily, it’s easy to find some not-so-well-kept secrets when it comes to fantastic Boston indoor activities! Read on below to see 6 of our personal favorites. Want a relaxing and educational(don’t tell the kids) way to spend some time in the city? Well then, Boston Aquarium has you covered. With an array of some of the most interesting sea life you’ll glimpse outside of going on a S.C.U.B.A. trip yourself, the New England Aquarium packs in fun for all members of the family. All of this underwater excitement culminates in a massive four-story cylindrical Giant Ocean Tank that is simply awe-inspiring. If you’re new to the city, you can’t go wrong adding this one to your Boston indoor activities itinerary! A tangential take on the ‘escape room’ format, Boda Borg offers a series of ‘quests’ for players to dispatch their best wit on in order to complete. Always had a hankering to explore a haunted house or navigate a treacherous jungle? Well, Boda Borg is here to satiate that thirst. The challenges that ensue are both mental and physical so be sure to come prepared to sweat! Maybe you’re all puzzled out, just came off a 6-month deep sea diving trip, and just want to sit back and cap off your Boston indoor activities extravaganza with some gut-busting laughs. Then look no further than Boston’s very own Improv Asylum! Boasting hysterical live improv shows 6 nights a week, there really is no excuse not to give them a visit. And after the show, maybe ask about one of their many improv classes that you can sign up for. Then you can prove once and for all to your friends that you are in fact funny and that you never knew what you were talking about, Chad! If you’re a fan of music, then there’s no shortage of outlets for you to get your concert fix. From the popular House of Blues, to the intimate Brighton Music Hall, all the way to famous Fenway Park, the music is always bumping in Boston! If you’re not from the Northeast then you’ve definitely heard the mythical tale of a Dunkin’ Donuts on every corner. Well, it’s true! While not an official tour by any stretch of the imagination, I sincerely implore you to try your best to make it into the over 60 locations and write tales of what you discovered. In terms of Boston indoor activities, I’d rate this three strawberry frosted donuts out of a bacon, egg, and cheese on a croissant. I’ll let you figure out the conversion factor for that. What I will tell you is that tales of this adventure definitely reek of best-selling book potential – all it needs is an author! And naturally, last but certainly not least is our personal favorite, Trapology! If you’re looking for an outside of the box experience, then this one’s for you! 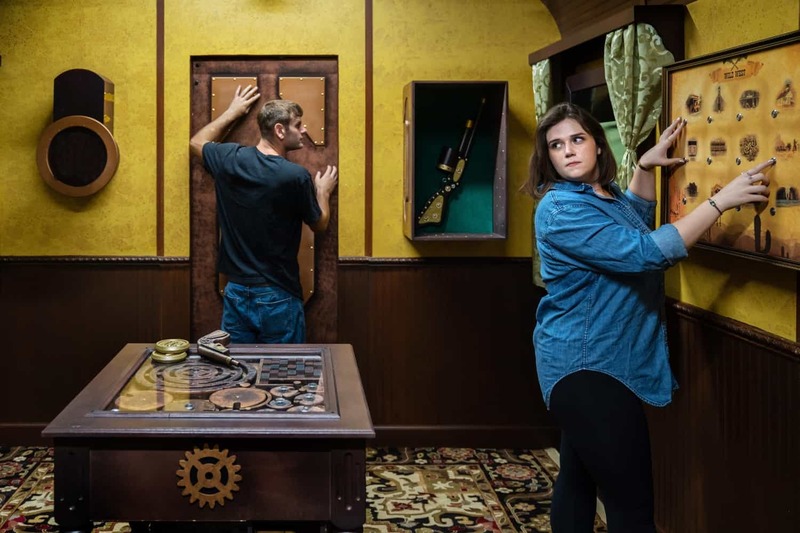 Coming in strong with a plethora of puzzles and knack for creating immersive experiences, Trapology Boston is a terrific way to spend an hour with friends. Always wanted to save yourselves from a sinking submarine haunted by a real angsty ghost? We have you covered. Or maybe ever since Shawshank you’ve had a strange dream to stage an elaborate prison break. You know, minus the whole ‘going to prison for life’ thing. That dream isn’t strange to us, in fact we’ve dedicated a whole room to the pursuit of that dream. Really, we’re just here to fulfill fantasies and make smiles happen. Sure, we’re a little biased, but we’d love the opportunity to have you come in and play a game so we can show you why we’re so confident that a visit to us will be the highlight of your day in the city! Of course, when it comes to Boston indoor activities there are way more than six. But if you want a fun way to spend a day in the city, there’s no way you can go wrong with any of these. And, seriously, if you do the Dunkie’s Tour and strike a publishing deal, I’m strongly expecting a mention in the back of that book somewhere. You can come over to 177 Tremont Street to talk details. Until then, enjoy your time in the city!